For liquid manure, empty your storage enough to make it through the winter then apply the rest in spring. This will allow you to apply manure at lower rates in each field. Find fields that are level and have crop residue. Keep a distance from sensitive features. 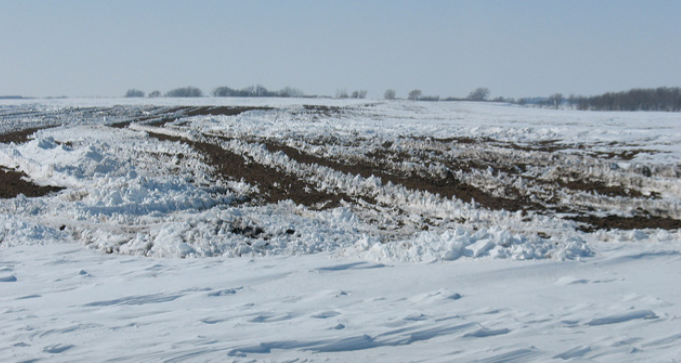 When you cannot incorporate because of winter conditions, regulations state you need a 300 foot setback from streams, lakes, drainage ditches, and open tile intakes. Check out the Runoff Risk Advisory Forecast to help make these decisions. Refer to your state or local permit for specific details on land application restrictions. When in doubt about restrictions, contact your MPCA or county feedlot official with questions. Visit MPCA’s website for contact information. Monitor field edges to verify that manure runoff is not occurring. If runoff is occurring, report to the Minnesota Duty Officer at 800-422-0798. Remember that state and local manure application requirements may be different depending on feedlot size, permit status, and local laws. For more information from the MPCA, check out their “Land application of manure” webpage: www.pca.state.mn.us/quick-links/land-application-manure.